A mandala is a form of meditation, creating a beautiful picture from a mindful state. 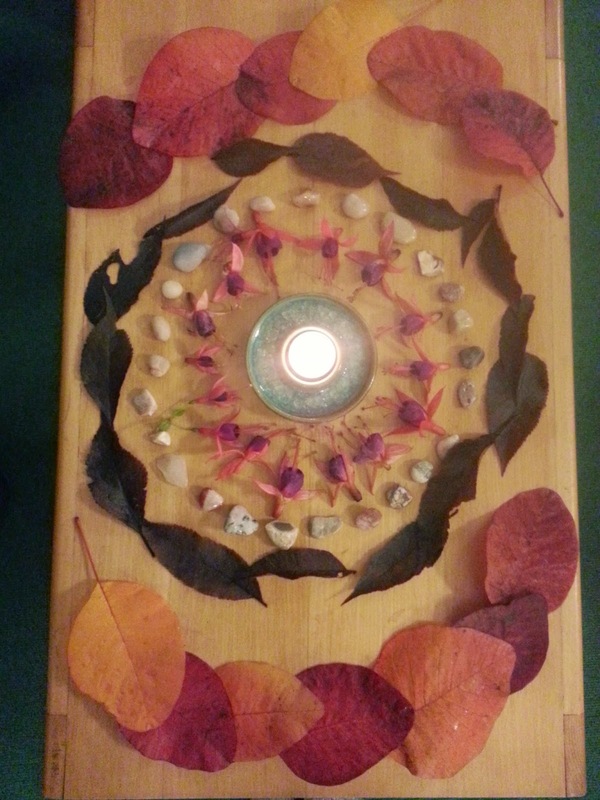 Last night my sangha (the group I practise meditation with) held a special evening contemplating death and continuation. This was very appropriate as our teacher Thich Nhat Hanh is currently seriously ill in hospital. We asked people to bring in photos of their ancestors and loved ones who had passed on and so it seemed fitting to create a beautiful setting around which the photos were placed. Here is the mandala I created. The leaves and flowers were all collected from my garden. The large leaves (Cotinus Grace) were still wet from the morning's frost. The white pebbles have all been collected over the years and some were polished many years ago by my Grandpa. I remember the odd noise coming from his cellar as his 'rumbler' tumbled and polished the stones.